Ocean Creek Resort is a unique North Myrtle Beach resort property. It is 57 acres of sheer enjoyment. Ocean Creek North Tower is the high-rise tower of North Myrtle Beach vacation rentals, which is on the oceanfront of this large resort property. Exquisitely positioned so that a saltwater channel runs directly in front of the Ocean Creek North Tower, the channel must be crossed so you can reach the white sandy beaches. It is a gorgeous setting, one where all the North Myrtle Beach vacation rentals have an ocean view from their private balcony. This gated North Myrtle Beach resort is in the Windy Hill section of North Myrtle Beach, South Carolina. It is a North Myrtle Beach resort that is across the street from a very popular North Myrtle Beach vacation destination, Barefoot Landing. This North Myrtle Beach attraction is where you will find shopping, dining and live entertainment, including House of Blues and The Alabama Theatre. Ocean Creek North Tower has an ocean view swimming pool and sun deck. Lounge chairs surround the swimming pool so you can fully relax while the kids play in the pool. Get a suntan while reading the latest bestseller. Take a refreshing dip in this ocean view swimming pool everyday of your North Myrtle Beach vacation. Choose a two-bedroom North Myrtle Beach vacation rental at Ocean Creek North Tower. 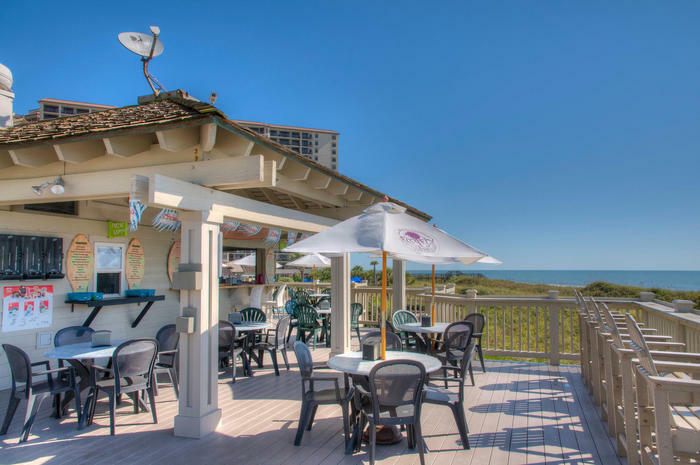 With accommodations for six people, these North Myrtle Beach rentals are a wonderful retreat for your North Myrtle Beach vacation. Each of these two-bedroom condos in North Myrtle Beach, South Carolina has two baths for your convenience. The master suite of each of these North Myrtle Beach condominiums opens to the ocean view balcony. Your family can also access the ocean view balcony of your North Myrtle Beach rental at Ocean Creek North Tower through the living room. Comfortably furnished, these living rooms are filled with sunlight because of the sliding glass door to the balcony. Use the dining area in these North Myrtle Beach rentals as you please and take advantage of all of the appliances in the well equipped kitchen at Ocean Creek North Tower’s condominiums. There is even a dishwasher in the kitchen of these North Myrtle Beach vacation rentals. Elliott Beach Rentals is not affiliated with onsite management or the HOA of Ocean Creek North Tower.